Neal C. Olinger, 76, of Annawan, Illinois, died Saturday, January 28, 2017, at Hope Creek Care Center, East Moline. A Celebration of Neal’s life will be announced at a later date. Cremation will take place at Trimble Crematory, Moline, under the direction of the Cremation Society of the Quad Cities. Memorials may be made to the family to be distributed among Neal’s favorite charities. He was born July 31, 1940, in Lyndon, Illinois, the son of Donald and Elsie (Allen) Olinger. He married Beverly Bracke on September 5, 1964, in Prophetstown, Illinois. He served in the U.S. Army Reserves. Neal was a self-employed farmer for over 25 years before working for Wyffels Hybrid in Atkinson for 20 years, retiring in 2010. He was a member of Sacred Heart Catholic Church in Annawan. He was a member of the Knights of Columbus, serving as Grand Knight. He was also a 4-H leader for many years. 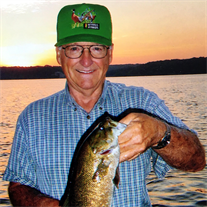 Neal loved his children; he enjoyed hunting in Wisconsin with his son, Kevin; going to county and state fairs showing Simmental cattle with his daughter, Darcy; and fishing on the Mississippi River in his Ranger bass boat with his son, Jason. Neal is survived by his wife, Beverly; two sons, Kevin (Debbie) Olinger of Black Earth, Wisconsin, and Jason (Agatha) Olinger of Roselle, Illinois; two grandchildren, Brianna and Dylan; siblings, David (Gladys) Olinger of Prophetstown, Don Olinger of Davenport, and Sandra (Richard) Johnson of Marenisco, Michigan; and several nieces and nephews. He was preceded in death by his parents and a daughter, Darcy Olinger. The family would like to give special thanks to the staffs of Hospice Compassus and Hope Creek Care Center for their wonderful care.